At Our Lady of Mercy Catholic School, we believe that parents are the first and primary educators of their children. Faculty, staff, and administration partner with parents to provide an authentic Catholic environment where each student is given the opportunity to reach his or her fullest potential by discovering and developing their God-given gifts. Our Lady of Mercy seeks to form the whole child, providing strong foundations of prayer, knowledge, and service to equip each child for Christian life in the 21st century. We believe that the ultimate goal of a Catholic school is to help each of its students get to Heaven. In a nurturing community of faith, students at Our Lady of Mercy cultivate Christian virtues and are inspired to become the men and women God calls them to be. The Catholic faith is the fabric of our school and is integrated into all aspects of student life. Through prayer, liturgy and the Sacraments, and Church teachings, students encounter Christ and develop a personal relationship with Him. We believe that a solid intellectual foundation enables children to reach their potential and prepare for a lifetime of learning. 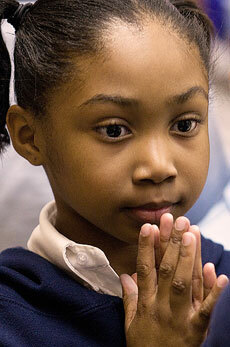 Our Lady of Mercy challenges each child to strive for academic excellence beyond basic skills. Using differentiated instruction and educational technology, teachers engage each unique learner in the acquisition of knowledge and the cultivation of natural curiosity. As students become active participants in their learning, they develop skills of research and discovery and are equipped to successfully meet the challenges of further education. We believe that faith is manifested in a life of service. At Our Lady of Mercy, students become aware of their place as citizens of the world, learning that their unique gifts are meant to be shared to build the Kingdom of God. Through service projects, extracurricular activities, athletics, and leadership opportunities, students learn to imitate Christ by serving others and contributing to the good of the community.